Downtown Moncton Gift Cards are universal gift cards that can be used at participating downtown Moncton businesses. All businesses in downtown Moncton can participate in this program at absolutely no cost. It’s easy to participate and doesn’t cost a penny, plus Downtown Moncton Gift Cards encourage local spending. Accept customers’ Downtown Moncton Gift Cards at your business and cash in on this fantastic program! Why accept Downtown Moncton Gift Cards? Accept Downtown Moncton Gift Cards just like you would a debit or credit card for sales at your establishment. Reimbursement method: As soon as the Downtown Moncton Gift Card is used at your establishment, the funds are automatically deposited into your account, just like they would with the use of a debit or credit card! Simple as that! No risk or cost to downtown Moncton businesses. Just the opportunity for the public to use their Downtown Moncton Gift Cards in your establishment. Downtown Moncton Centre-ville Inc. (DMCI) anticipates selling $30,000 worth of Downtown Moncton Gift Cards in the first year. 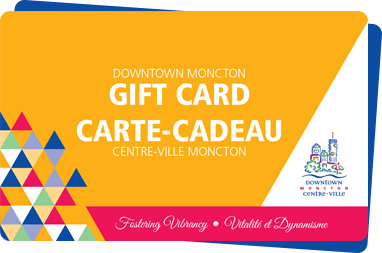 Twice a year, DMCI will sell Downtown Moncton Gift Cards at 20% off ($0.80 cash for $1 DMCI Dollar). For instance, a person can purchase $500 of Downtown Moncton Gift Cards for only $400 cash, which must be used at participating Downtown businesses. The discount DMCI will offer during the two sales will be absorbed by Downtown Moncton Centre-ville Inc.’s advertising budget. It does not impact the businesses who accept our Downtown Moncton Gift Cards. Also, Downtown Moncton Gift Cards will be available year round for the public to purchase at full value should they want to give them as gifts for weddings, anniversaries, birthdays, employee incentives, etc. This allows recipients to choose multiple locations to spend their Downtown Moncton Gift Cards. *The Downtown Moncton Gift Card is issued by Peoples Trust Company.